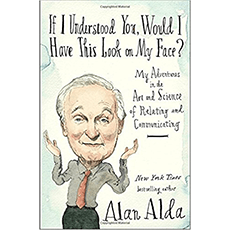 In “If I Understood You, Would I Have This Look on My Face?”, Alan Alda tells of his quest to learn how to better communicate and develop empathy. The award-winning actor and author has been on a journey to discover new ways to help people communicate and relate to each other more effectively. With humor, candor, and wit, Alda explains where and how he found inspiration, including having interviewed thousands of scientists to help them communicate complex ideas that a wide audience could understand. Alda provides tools of communication that he teaches from the Alan Alda Center for Communicating Science to show the benefits from being better communicators.